Review Summary: Suit up your armor, saddle your horse, and prepare for an epic, adventurous quest, because Rhapsody of Fire are back in action. Let’s face it, when it comes to Rhapsody of Fire, you know the drill: speedy guitar riffs, grandiose orchestral melodies, a sixteen minute ending song, and incredibly cheesy vocals from a Weird Al Yankovic look-alike behind the microphone. Admittedly, this is essentially the exact same standard that Rhapsody of Fire has thrown at us for almost twenty years at this point, and yet for some reason we still keep coming back to it. Normally, we would equate incredible amount of consistency as a way of not being able to evolve musically. However their shtick has ultimately worked for them with almost every album they've put out, and their latest, Into the Legend is no exception. Pretty much every aspect of this record is everything we’ve seen before by Rhapsody of Fire. The only difference is the execution on how well it all fits together in the end. It’s the mixing, the sound, atmosphere, and energy that sets each album apart from one another and Rhapsody of Fire is so good at tweaking every single album that we remember exactly how all of them sound like. When 2013’s Dark Wings of Steel dropped, it felt as though Rhapsody of Fire just couldn’t deliver the same amount of impact without founding member Luca Turilli. It wasn’t a bad album, but it more or less showed a band struggling to prove themselves to the rest of the world, which resulted in a slight disappointment. However, Into the Legend seems to show Rhapsody of Fire back in top form as songs like ‘Distant Sky’ and the title track as they immediately set the record’s tone and provide rigorous amounts of energy. The orchestral melodies are as strong as they were on Frozen Tears of Angels, perhaps even stronger in certain areas, as they carry the songs so effortlessly while also giving the rest of the record substance. The instrumentation overall is performed well, Roby de Micheli helps provide arguably some of the best guitar solos known in the band’s career, contained in songs like ‘Realms of Light’ and ‘Rage of Darkness’. Alex Holzwarth keeps the beats lively and focused with his drum performance. Alex Staropoli, as usual, does great in with the orchestra arrangements and the production. And Lione manages to deliver one of the best vocal performances in his career with incredibly memorable choruses that shine through most of the record. Ironically enough, the lyrical content in Into the Legend feels more personal this time around, such as in the album’s slower melody ‘Shining Star’. Yeah, they’re still cheesy (we’re talking about power metal here), but they feel as though they add more weight to the emotion instead of being nothing more than bloated exposition. Since the band is no longer relying on a concept, Lione’s lyrics focus less on the fantastical and more on reality. They aren’t exactly trying to be deep about their feelings, but it's not as over-the-top as much of their previous material. Even so, their one attempt at being dark in terms of the tone, ‘Winter’s Rain’, does end up dragging the album down, with constantly repeated guitar riffs and orchestral filler that end up dragging the song’s pace. Then there’s the closer, “Kiss of Life”, with a lack of a decent climax and incredibly slow pacing just for the sake of making it a sixteen-minute song, it surprisingly ends up being a disappointment. Despite the good performances on both tracks, they feel more pointless than satisfying. Even so, neither track really ruins the experience the rest of the album gives. 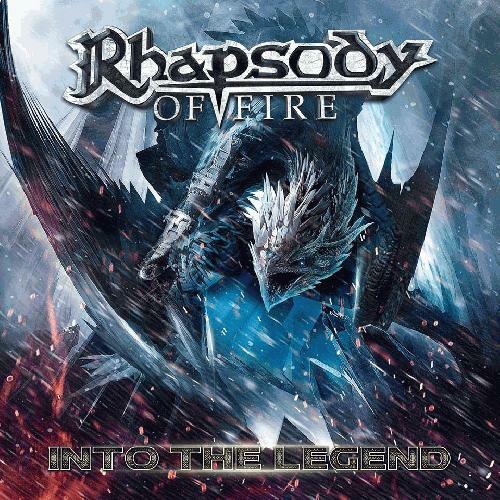 Into the Legend is essentially what you’ve come to expect from Rhapsody of Fire. It’s predictable, corny, and downright ridiculous at times, but they aren’t meant to be taken seriously in the first place. Even so, this album manages to deliver a solid hour of well-performed and well-written cheese without sacrificing the band’s identity (though with this band’s track record that would be hard to accomplish). Rhapsody of Fire still manages to give us tremendous amounts of fun in their music, even after over twenty years, and for what it’s worth, I’d be happy to listen to this several times over. Thanks for CometoDaddy for proofreading but as usual additional feedback is appreciated. First review of the year, and first one in a while so I might be a bit rusty. Mass Effect has taken over my life recently and first day of classes is today. Also it's been a long time since I reviewed an album by these guys, need to go back to my discog reviews at some point. Unsurprising but fun record. Nice review! Not sure if I'll check this one but I respect these guys for being so consistent over the years. I remember reading a Legendary Tales review on Metal Hammer when the album came out like it was yesterday and being drawn by the cover art. nice review, might give this a listen. @game you really should jam it more often, there's some really good stuff out there. i enjoy nightwish, kamelot and blind guardian. so i like my corn pre buttery sometimes. Okay imagine all of those bands, alongside Dragonforce, x10. They're previous stuff is like D&D meets WoW meets LOTR. I think you're making it sound scarier than it is, haha. "They're previous stuff is like D&D meets WoW meets LOTR." I like the second album the most. Is this worth a download? How does it compare to say, Dragonflame? Or SOEL 1 (in quality)? "Suit up your armor" - don your armor maybe? cuz if you try to apply the same wording to anything else it sounds awry. Almost sounds like your putting a suit over your armor. I'm being a picky prick here but I can help it :P.
"in top form as songs like ‘Distant Sky’ and the title track as they immediately set the record’s tone" - I'd take out 'as they'. Great review man, this sounds like a blast so I'll check it out for sure. Never jammed these guys. Maybe I should check this out. "Suit up your armor, saddle your horse, and prepare for an epic, adventurous quest, because Rhapsody of Fire are back in action."